Members of the Uganda Local Government’s Association (ULGA) this afternoon attacked Justice and Constitutional Affairs minister Gen Kahinda Otafiire who had taken to the podium to address their meeting at Mandela National Stadium (Namboole). ULGA is an umbrella organization of local governments and is mandated to foster common positions on key issues that affect local governance through lobbying advocacy and representation of local governments at local national and International fora. Defiant Otafiire was forced off the stage by angry delegates. Courtesy photo. The minister went to the venue where members of the Uganda Local Government’s Association (ULGA) had converged expecting to be addressed by President Museveni who was programmed as the chief guest. They were, however, disturbed when Minister Otafiire was instead delegated to address them despite their protests. According to witnesses, the group was furious because the minister couldn’t confirm to them whether or not the President would attend. The irate local leaders forced Otafiire off the rostrum amid angry chants, as other members hurled bottles of water at him. “We expected the President to address us and not Otafiire. 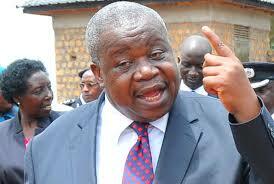 He would have simply told us in which capacity he was addressing us but instead treated us like children,” Kayemba said. The meeting had been called to discuss the implementation of Vision 2020 that aims at transforming Uganda into a middle income country and was running under the theme, “Uganda Vision 2020 and Addressing Middle Income Status Opportunities, Barriers and the Role of Local Governments”.